Confocal microscope has become a power full tool of choice for researchers interested in serious imaging of cell structure and function. These microscopes revolutionised our view of cells and became a major instrument in unravelling the complexities of the morphology and dynamics of cells and tissues. Initially it was used to observe the general spatial distribution of usually one or two fluorescent labelled structure or cell population in living or fixed samples. Now researchers can distinguish between two closely spaced structures within a specific organelle such as visualising RNA polymerase II mediated transcription sites associated with speckles in the nucleus. High resolution confocal microscopy has been used during in situ hybridisation to localise specific gene sequences to specific chromosomes. With the recent technological advances confocal microscopes have opened a new world to biologists interested in the dynamic complexities of the cell and to the researchers in life sciences. 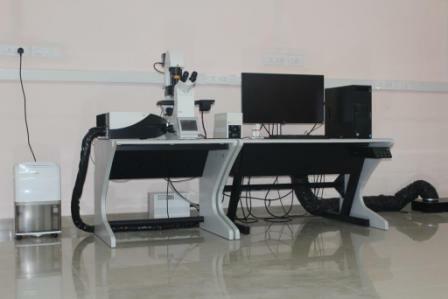 The microscope was purchased and installed at the New Sophisticated Instrumentation and Computation centre in March 2016. With the synergies of multi band spectral detector, acousto-optical beam splitter (AOBS) and super sensitive Leica HyD the microscope provide maximum photon efficiency and gapless spectral detection.This superior sensitivity directly translate into reduced laser power for cell viability and resolution. The AOBS (Acousto-Optical Beam Splitter) is a completely transparent, active TeO2 crystal, which offers maximum photon efficiency. An acoustic wave coupled into the crystal changes its transmission properties. It switches within microseconds by simply changing the radio frequency of the wave. This makes the AOBS a uniquely flexible, efficient, and fast beam splitter. The AOBS can accommodate up to eight reflection bands.